Time is of the essence ? 5 minutes until bus ? Use timey! 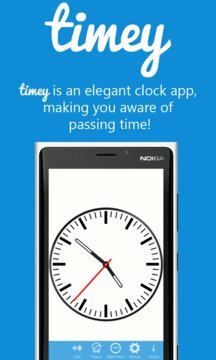 Timey is time keeping application, suited for busy people living in the rush! Set repeating time, so timey will speak every 3,5,10 or 15 minutes to remind you about passing time! It's so convenient and easy to use! 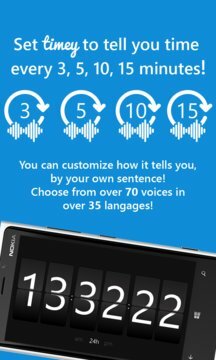 You can customize speaking sentence, choose from over 70 voices in 35 languages ! And all this for free! Choose form 5 elegant watch faces and tune them as you want!